This 4 yolk egg weighing at just under 100grams was revealed today when MB was whipping up a plum cake. An excited MB was sure it had to be a record breaker. MDR took this pic then MB googled and found a similar egg was reported in the UK in 2009, the article goes on to say that the record yolks in one egg is 9! MB's hopes for a record have been completely scambled. The egg is from a "super jumbo" pack purchased from Yamagishi Happy Eggs in Innisfail. 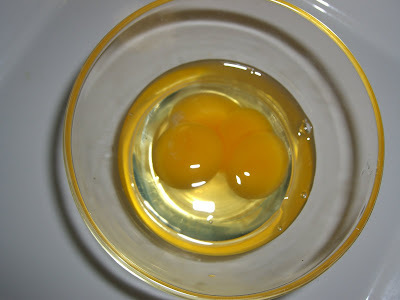 The super jumbos often produce double yolkers but MB has never seen a triple or quad yolker before. what a bonus, love the super jumpo Yamagishi eggs. How did the plumb pudding turn out? The curious thing about our 4 yolk egg was that it graded as a small egg and weighed much less than the 100 gramme egg that you found. Multiple yolk eggs are usually laid by young hens when their bodies are still adapting to the onset of lay. It seems remarkable that a 9 yolk egg was laid.